NORTH PROVIDENCE – In small stretches of Mineral Spring Avenue at either end of town, the speed limit is 25 miles per hour. On the rest of this very busy roadway, the top allowable speed is 35 miles per hour. 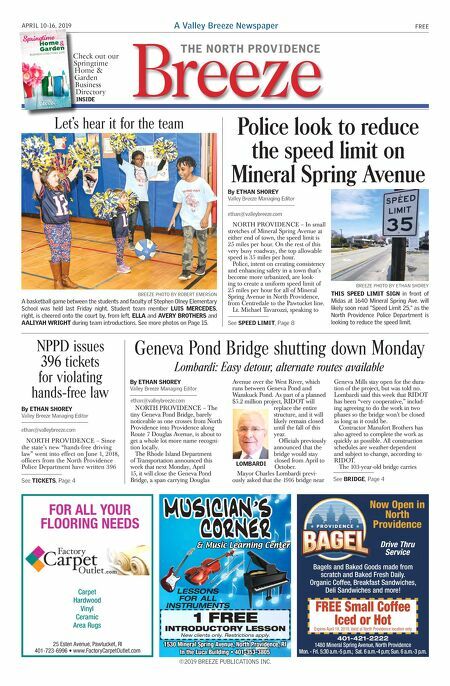 Police, intent on creating consistency and enhancing safety in a town that's become more urbanized, are look- ing to create a uniform speed limit of 25 miles per hour for all of Mineral Spring Avenue in North Providence, from Centredale to the Pawtucket line. Lt. Michael Tavarozzi, speaking to ethan@valleybreeze.com BREEZE PHOTO BY ETHAN SHOREY THIS SPEED LIMIT SIGN in front of Midas at 1640 Mineral Spring Ave. will likely soon read "Speed Limit 25," as the North Providence Police Department is looking to reduce the speed limit. See SPEED LIMIT, Page 8 BREEZE PHOTO BY ROBERT EMERSON A basketball game between the students and faculty of Stephen Olney Elementary School was held last Friday night. Student team member LUIS MERCEDES, right, is cheered onto the court by, from left, ELLA and AVERY BROTHERS and AALIYAH WRIGHT during team introductions. See more photos on Page 15. Let's hear it for the team NORTH PROVIDENCE – Since the state's new "hands-free driving law" went into effect on June 1, 2018, officers from the North Providence Police Department have written 396 NPPD issues 396 tickets for violating hands-free law By ETHAN SHOREY Valley Breeze Managing Editor ethan@valleybreeze.com See TICKETS, Page 4 Geneva Pond Bridge shutting down Monday Lombardi: Easy detour, alternate routes available NORTH PROVIDENCE – The tiny Geneva Pond Bridge, barely noticeable as one crosses from North Providence into Providence along Route 7 Douglas Avenue, is about to get a whole lot more name recogni- tion locally. The Rhode Island Department of Transportation announced this week that next Monday, April 15, it will close the Geneva Pond Bridge, a span carrying Douglas Avenue over the West River, which runs between Geneva Pond and Wanskuck Pond. As part of a planned $5.2 million project, RIDOT will replace the entire structure, and it will likely remain closed until the fall of this year. Officials previously announced that the bridge would stay closed from April to October. Mayor Charles Lombardi previ- ously asked that the 1916 bridge near Geneva Mills stay open for the dura- tion of the project, but was told no. Lombardi said this week that RIDOT has been "very cooperative," includ- ing agreeing to do the work in two phases so the bridge won't be closed as long as it could be. Contractor Manafort Brothers has also agreed to complete the work as quickly as possible. All construction schedules are weather-dependent and subject to change, according to RIDOT. The 103-year-old bridge carries By ETHAN SHOREY Valley Breeze Managing Editor ethan@valleybreeze.com LOMBARDI See BRIDGE, Page 4 THE NORTH PROVIDENCE ©2019 BREEZE PUBLICATIONS INC. A Valley Breeze Newspaper THE NORTH PROVIDENCE Breeze FREE APRIL 10-16, 2019 Now Open in North Providence Bagels and Baked Goods made from scratch and Baked Fresh Daily. Organic Coffee, Breakfast Sandwiches, Deli Sandwiches and more! Drive Thru Service Expires April 19, 2019. Valid at North Providence location only. FREE Small Coffee Iced or Hot 401-421-2222 1480 Mineral Spring Avenue, North Providence Mon. - Fri. 5:30 a.m.-5 p.m.; Sat. 6 a.m.-4 p.m; Sun. 6 a.m.-3 p.m. Carpet Hardwood Vinyl Ceramic Area Rugs FOR ALL YOUR FLOORING NEEDS 25 Esten Avenue, Pawtucket, RI 401-723-6996 • www.FactoryCarpetOutlet.com 1530 Mineral Spring Avenue, North Providence, RI In the Luca Building • 401-353-3805 & Music Learning Center 1 FREE INTRODUCTORY LESSON New clients only. Restrictions apply. LESSONS FOR ALL INSTRUMENTS By ETHAN SHOREY Valley Breeze Managing Editor Police look to reduce the speed limit on Mineral Spring Avenue Check out our Springtime Home & Garden Business Directory INSIDE Let's hear it for the team Check out our Springtime Home & Garden Business Directory INSIDE Published by BUSINESS DIRECTORY 2019 Home Garden Springtime & ©2019 BREEZE PUBLICATIONS INC.